PM Narendra Modi had announced that he desires to create a strong digital framework in India.This application was designed by the National Payments Corporation of India. 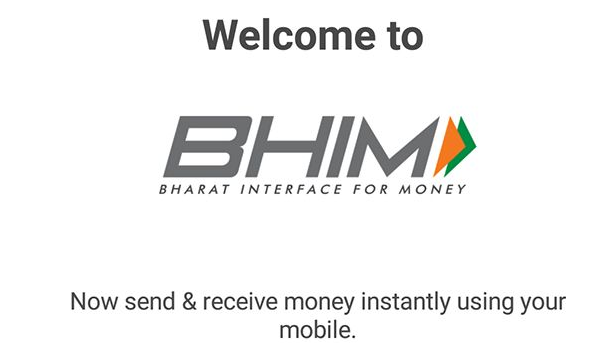 The full form of BHIM is Bharat Interface for Money. This application makes receiving and paying money easy via QR code scanning or the UPI ID.There is always a difference between elegance and efficiency. There is always a difference between “feature-rich” and “getting-the-job-done”. Which pair would you want – “Elegance and Feature-Rich” or Efficiency and Getting-the-Job-Done”? Our vote invariably goes for the second one and this is where we need to vote for BHIM app. NPCI or National Payments Corporation of India came up with world’s most advanced digital transaction system that beats even the hyped ‘Bitcoin’ and ‘Litecoin’ of the overhyped Silicon Valley. While Bitcoin and Litecoin calls for extreme usage of computer resources as they need to be mined by systems continuously running at over-optimal capacity, NPCI’s UPI or Unified Payments Interface makes digital payments easy. All you need is a smartphone (you don’t even need any high-end smartphone that will cost you a fortune) and a medium for connecting to the internet. That medium can be mobile data or it can be a Wi-Fi connection. Yes, UPI is that simple! And… once UPI came online, many private players came up with feature-reach UPI apps. One such example is PhonePe – launched by Flipkart in association with Yes Bank. However, a feature-rich app such as the PhonePe is, despite being really effective in accomplishing a number of tasks, pretty confusing. Not to mention, there are too many features which most of us never use. The whole purpose of UPI-enabled apps is to ease the process of digital transactions and bypassing the need of maintaining even a digital wallet, which is known for killing the whole need for carrying currency notes (and coins) and even plastic money. This is where BHIM app comes in. Designed with only one purpose in mind, BHIM app has come out in market with all guns blazing. Its sole purpose is to help people transact digitally. In terms of simplicity, BHIM has killed every competition out there in market, whether we are looking at simple apps like Baroda MPay or SBI Pay (which are by far the simplest of all other UPI-enabled apps apart from BHIM). So, what really is BHIM app? We were expecting this question. See, it is basically an application that is to be installed on your smartphone (yes, you need a smartphone to use this app). However, BHIM can also work if you have a feature phone. Once installed, it will allow you to send money to someone or receive money from someone directly into a bank account. You really don’t need to use a bank account number or IFS Code or beneficiary name to send money. All you need is VPA or Virtual Payment Address. It is basically an address that looks very much like an email-ID. For instance, let us assume that you want to send money to someone whose name is Arvind Agarwal. All you have to do is use the id “arvind@upi”. That’s it! That’s all you need. Nothing more, nothing less. How does it really work? We will come to this later. You can send money to any bank. However, you need to ensure that the bank account where you are sending the money has support for BHIM. The whole list of supported banks or participating banks will be given later in this article. BHIM has no transfer lag. This simply means that all money transfers take place in real time and instantly. There are no holidays! It works 24x7x365. Simply put, you can send money or receive money anytime during the day and any day during the year. You really don’t need to have internet banking activated with your bank. You can check your bank account balance using BHIM app. You can pay merchants using BHIM app simply by scanning Bharat QR Code. Special features of BHIM app? Payment using Aadhaar Number: Yes, if you know the Aadhaar Number of someone, you can use that to send money as well. Payment using IFS Code and Bank Account Number: This is the old-fashioned method of sending money. Conventionally we have been using this for NEFT transfers. However, when you are using this method through BHIM, it will by default make use of IMPS service or Immediate Payment Service. The app allows blocking spam ‘Collect Request’ that anyone can send to you. In case you are having any problem with the app itself, you will be able to report the issue. You can choose the language you prefer. The app has support for multiple languages (currently 9 languages are supported). The app allows you to reverse or refund a payment you have received. The app will allow you to set a new passcode in case you forgot the one that you have already set. The app has a built-in security feature wherein, it will automatically log you out of the app if you have been inactive for four minutes. It will show you the list of all transactions you have made (this includes money sent and money received). It will also show you any pending transaction. It will automatically refund the money to your account if ‘sending’ fails because of any technical glitch. The reversal takes place in real time. How to use BHIM app on Smartphones? Okay, using BHIM on smartphones is not at all a rocket science. It is easy, fast and efficient. We will take you through the steps one at a time. Be patient as the information we provide will be somewhat detailed. It is for your benefit only. Head on to Google Play Store. Type in BHIM in the search bar and check the results. The app has an orange and green logo and it reads BHIM – MAKING INDIA CASHLESS. On the list that you see, you will see a rating of 4.0 and you can see the name National Payments Corporation of India (right below the app name). NOTE: You make come across some fake apps which use the same name and somewhat similar logo. There is actually another app which reads ‘JAI BHIM USSD BHEEM UPI Tips’. It is a fake app and the logo looks same except that the colors are interchanged for the logo. So, BEWARE of those apps. Once you locate the app, tap on ‘Install’ button and give the permissions it asks for. Once the permissions are granted, the app will be installed automatically. The moment the app fires up, you will be required to select your preferred language for the app. Select the one that you want to use. Once you select the language, a few basic features of the app will be shown inside the app. Just swipe through. This permission to read and send SMS from your phone is important because the app needs to verify your phone number. The reason the app will verify your phone number is that the app will want to know whether you are using the same phone number which has been registered with your bank (for mobile banking) or not. You will need the same number because UPI works through mobile phones. It is basically a mobile payments system which allows instant money transfer. Also, since the app bypasses the need for using bank account number and IFS Code for money transferring, it uses mobile number to send and receive money. Basically, your mobile number will be set up as the default VPA but you will also have the option of setting up a different VPA or use Aadhaar Number or Bank Account and IFS Code for transactions. In case you have a dual-SIM phone, you will get the option of selecting the SIM you want. Make sure that you select the SIM whose number is associated with your mobile banking. Once you take care of these initial requirements, you will be asked to set a 4-digit passcode. This is basically the password that you will need to log in into the app. You need to provide the passcode once again to verify that you have entered the correct passcode and that you want to use it as your login passcode. The moment the passcode has been sent, the dashboard of the BHIM app will be shown to you. Select the BANK of your choice from the list of banks. The app will automatically retrieve the account(s) you have with the selected bank. How does it do that? Remember that mobile number you had to select? Yes, the BHIM app will take your mobile number and pull up the information about your bank account(s) with your selected bank. If you have multiple accounts, you will be asked to select the account that you want to use. You may actually have multiple accounts with the same bank and you need to select the one that you want to use. Now, once you select the bank account, the app will automatically link with your bank account. This linking takes place in the background and nothing will be shown on the forefront of the app. That’s it! You have successfully set your bank or linked your bank with BHIM app. What if you want to change your bank account? You have multiple bank accounts with a single bank and you want to switch the account. You have single bank account with multiple banks and you want to switch the bank. On the dashboard, towards the end of the screen, you will see the option which reads: “Bank Account”. Tap on that option. On the next screen, you will see the bank account that has been linked with BHIM app. On top right corner, you will see three vertical dots. Tap on that and you will see the option which reads, “Change Account”. Select or tap on that option. Once you tap on “Change Account”, you will be asked for confirmation. Tap on “Proceed” if you want to change it or “Cancel” if you don’t want to change it. Now you need to go through all the steps mentioned above – selecting Bank to linking bank account. You will be done. “Note: You cannot keep multiple bank accounts linked with BHIM. Each time you want to switch your bank account from the same bank or bank account from a different bank, you need to go through all the steps mentioned above”. IN CASE: You have already used some other UPI-enabled app, you must have already encountered something called MPIN. UPI PIN and MPIN are basically the same thing except that BHIM will ask for a 6-digit PIN whereas, MPIN that you set with other UPI-enabled apps is a 4-digit PIN. You have to set the UPI PIN and it has to be a super-secret PIN. You cannot share it with anyone. If you do, your bank account will be at risk. Login to your BHIM app using your 4-digit passcode. On the dashboard, tap on the option which reads “Bank Account”. On the next screen, you will see your bank account. Below the bank account details, you will notice something written in ‘GREEN’ fonts. The green-colored font will say whether UPI PIN exists or not. If it doesn’t exist (of course it won’t exist unless you have already used BHIM app earlier and set the UPI PIN earlier), you will set the option of setting up a PIN. Tap on the option. Your Debit Card’s last 6 digits. Your Debit Card’s expiry year and month. A 6-digit PIN of your choice. Renter the 6-digit PIN you used. Once you have provided the details and proceed, the app will send an OTP on your registered mobile number and fetch the OTP on its own to authenticate. In case the automatic fetching is not taking place, you can always go ahead and enter the OTP manually. That’s all! Once OTP is authenticated, your UPI PIN will be set. You can change or reset your UPI PIN later from the Bank Account details screen. For resetting, you will have to provide your card details again whereas, for changing your UPI PIN, you need to provide the existing UPI PIN first and then enter the new PIN twice and proceed. There is a difference between resetting and changing. You should use reset option only if you have forgotten your UPI PIN that you have previously set. You should use change option only if you remember the previous PIN but want to change it to a different PIN. That’s it. When you start setting up your BHIM app by authenticating your mobile number, the app will automatically use the phone number and create a default VPA for you. For example, if your phone number is 1234567890, the app will set up the default VPA as 1234567890@upi. Log in to your BHIM app using your 4-digit passcode. On the dashboard that you see, you will notice the option which reads “Profile”. Tap on “Profile” and you will be taken to your profile details page where you will see a QR code and below the QR code, you will see the VPA. That is the default VPA that will be allocated to you. You will have the option of creating another VPA of your choice. For instance, if your name is “somename some-surname”, you can set your VPA as somename@upi or just any ID you wish. You just need to make sure that the ID you are creating has not been already occupied by someone else. Actually, the BHIM app will go ahead and cross check your ID with all registered IDs on its database and if the ID is available, you will be allowed to use the ID. Once you have set the ID, you will have the option of making the newly set ID as your primary VPA. Alternately, you can always keep your mobilenumber@upi as your primary VPA. You cannot create more than one VPA using BHIM app. This means, the maximum number of VPAs that you can have while using BHIM app is 2. The VPA that you create cannot be changed. So, make sure that you use an ID that you can easily remember. Even if you forget, you can always check your VPA from the profile section of the app. How will VPA work with BHIM? VPA is an elegant concept. The ID that is created is basically connected to your bank account. That means, it is liked to your bank account. So, every ID has to be unique and one ID cannot be used by two people. Your unique ID will be connected to your bank account(s) only. When you are sending money to someone and you are using that person’s VPA, the app will use the VPA of that person and identify his or her bank account and pull out the records of the bank account and transfer the money to that bank account only. This means, the need for using bank account number, IFS Code, beneficiary name, bank name etc. is completely eliminated. Isn’t that simple and elegant? What is QR Code in the profile section? Excuse us but we will go into the details right here and cover everything related to QR Code. The QR Code actually stands for Quick Response Code and was actually introduced in market by VISA. Now it is widely used. The QR Code that you see in BHIM app is basically a government-created QR Code known as Bharat QR Code. It works only with VISA, MasterCard and RuPay cards. It is independent of card brand and it is independent of bank. The QR Code or the Bharat QR Code (as in this case), has been designed to pull out your bank’s information, your phone number and your name. So, this code basically has your details. No matter which bank you use and no matter which card you have used for setting up BHIM (remember, you used your card details for setting UPI PIN), the QR code will capture the details. On the other hand, QR Code generated by VISA alone will capture only and only the details of the VISA cards or banks using VISA services. Similarly, QR Code from MasterCard will capture only and only the details of MasterCard cards or banks using MasterCard services. You must have noticed the option of QR code with mobile wallets like Paytm, MobiKwik etc. They too will only and only accept the QR codes of their own company. Cross-capture of information is not allowed. Simply put, Paytm will not capture QR Code of MobiKwik and MobiKwik will not capture QR Code of Paytm. In case of Bharat QR Code, irrespective of the card you are using and irrespective of the bank you are using, the information will be captured by BHIM app. However, it will not capture the information of any digital wallet’s QR Code. So, why do you need this QR Code? Actually, you will need it if you are a merchant. Assuming that you are a merchant, you can have the QR Code printed on a piece of paper and have it displayed at your shop. Anyone who comes to purchase something from you can pull out his or her smartphone, open BHIM app, log in and then tap on “Scan and Pay”. The app will open a scanner and the person needs to point the camera of his or her phone to the QR Code you displayed. The BHIM app of the person will capture the information on the QR Code on display and pull out the information like mobile number or VPA. The customer then needs to enter the amount he or she wants to pay to you and tap send. The money will be sent to your bank account directly and instantly. This means, you don’t have to give your bank details to your customer. You don’t even have to maintain a cash register or even keep your phone with you. The displayed QR code will be enough. Isn’t that simple and efficient way of paying someone or receiving money from someone? Login to your BHIM app using the 4-digit passcode. Tap on “Send” option that you see on the dashboard. You will be asked to provide the mobile number of the VPA of the person to whom you want to send the money. The app will automatically find out whether the phone number is registered with UPI servicers or not (remember, the phone number is automatically set as primary VPA). If you are using VPA, the app will verify whether the VPA is correct or not. Once the correct mobile number or the correct VPA has been received by the app, the app will take you to the next page where you can add the amount of money you want to send. You will also have the option of adding any remark. It is purely optional but it is a good practice to add a remark because it will help you to identify and recall the transaction quickly. Once you have added the amount you want to send and the remark (if any), you can tap on “Send”. This is where you will be asked for your 6-digit UPI PIN. Enter the UPI PIN and authenticate the payment. The money will be transferred immediately to the person’s bank account whose VPA you used. You can also use the Aadhaar number of a person to send money. It is simple and elegant as well. However, there is a requirement. The person (recipient actually) needs to ensure that his or her Aadhaar number has been linked to his or her bank account. You will be asked to provide the mobile number of the VPA of the person to whom you want to send the money. On that screen, on the top right corner, you will notice 3 vertical dot. Tap on it and you will see the option which reads “Aadhaar Pay”. Tap on it. On the next screen, enter the 12-digit Aadhaar number of the person to whom you want to pay and tap on “Verify”. The app will find out whether the Aadhaar number you provided is correct or not. Once verified, you will be taken to the next screen where you can enter the amount you want to send and add remarks. You will also have the option of saving the details for future use. Now tap on ‘Pay’ and you will be asked to provide the UPI PIN. Enter your 6-digit UPI PIN and authenticate the payment. You will be asked to provide the mobile number of the VPA of the person to whom you want to send the money. On that screen, on the top right corner, you will notice 3 vertical dot. Tap on it and you will see the option which reads “Account + IFSC”. Tap on it. On the next screen, enter the name of the beneficiary, the account number of the beneficiary and then re-enter the account number. Finally provide the IFS Code of the bank. Now tap on “Send” and on the next page you will be provided with the option of adding the money amount you want to send. You will also be allowed to add remarks if you want to. Finally, authenticate the payment using the 6-digit UPI PIN and voila! The payment will go through instantly. Tap on the option which reads “Request”. On the next page, enter the mobile number or the VPA of the person from whom you want to request the money. The app will verify whether the number or the VPA you have entered are registered with UPI or not. If the details you have entered are correct, you will be taken to the next page where you can enter the amount you want to request and enter the remark. Though the remarks aren’t mandatory, adding a remark will help the person to whom you are sending the request to not only identify you but to also understand whether your request is valid or not. Now submit the request and that’s all. The person on the other hand will get a notification and he can approve the request from his or her BHIM app or can simply reject the request. If the request is accepted, the amount will be deducted from his or her account and will be sent to your account immediately. On the next page, instead of adding VPA or mobile number, on the top right corner, locate the small symbol of a QR Code. Tap on it. You will be taken to a different page where you will be asked to enter the amount. You can also enter an optional remark and then tap on “Generate QR Code”. The QR Code will be generated that you can directly share from that screen or you can download the QR Code and send it to the person from whom you are requesting the money. The person who gets the QR Code will, if he or she accepts to pay, scan the QR Code using his or her BHIM app and that’s all! The app will directly deduct the money from that person’s linked bank account and credit the money to your bank account. Isn’t that simple and elegant? Okay, this is something you should memorize very nicely. In a single transaction, you cannot send / receive any more that INR 10,000 using BHIM app. In a single day, you cannot send / receive any more than INR 25,000 using BHIM app. Using BHIM app is completely free. There are not charges for using BHIM app as such. However, since BHIM uses IMPS or Immediate Payment Service, banks may actually charge some money as a fee. That amount is usually very nominal. GOOD NEWS: As of now, banks are not charging any money for providing money transfer service through BHIM. So, chill! In a single day, no more than 20 transactions can be made from a single bank account which has been linked with UPI platform. Which banks are associated with BHIM? Are there any safety issues while using BHIM? Nope! There aren’t any safety issues. The app is extremely safe. In fact, it is THE MOST ADVANCED digital payments system in entire world and even names like Silicon Valley are amazed by the simplicity and efficiency of UPI platform and BHIM app. When it comes to BHIM app itself, it uses triple authentication. First, you need to login to your app using a 4-digit PIN. It will log you out after you remain inactive for 3-4 minutes. The only way a transaction will take place through BHIM app is if you enter the 6-digit UPI PIN and authenticate the payment. Finally, once you install the BHIM app and set your 4-digit passcode and 6-digit UPI PIN, they can be used only and only on your phone. Basically, those codes will be associated with your mobile number and your device ID. No one else can use those codes on their own mobile phones. Finally, in case you didn’t know, NPCI created IMPS and now it has created UPI, which are both highly secured and state-of-the-art technologies. On top of that, BHIM works with all major banks in India, who have their own highly-secured networks. So, your money is absolutely safe. In case you didn’t know, NPCI is also regulated by Reserve Bank of India. So, NPCI will never run away with your money. Stay confident. By using BHIM, you will be using THE MOST ADVANCED digital payments technology in this entire world. You are safe. Really! In latest events, NITI Aayog CEO, Amitabh Kant has announced that the body has roped in popular Bollywood actor Sushant Singh Rajput. He will be working towards popularizing this app and ways in which, it can make monetary transactions easy.